For the bonito soy stock. Place water, dried anchovy packets and kelp into a pot and boil for half hour. Remove anchovy packets and kelp then put in the 2 packets of Katsuo and boil for a further 1 minute then remove them as well. Double the quantity of remaining liquid by adding the same amount in soy sauce. Boil for further 10 minutes. Add raw sugar to taste. 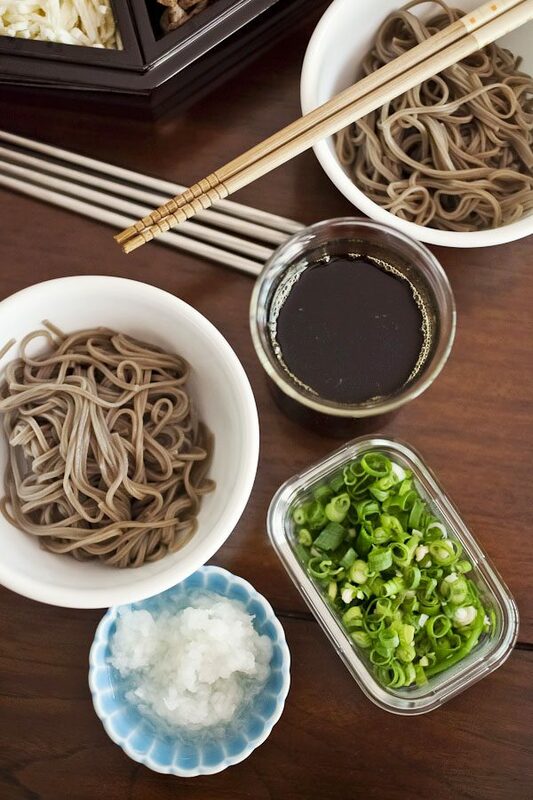 For the soba noodle. Boil in water until al dente then rinse in cold water and drain. To serve. Place a couple of ice cubes on the serving bowl with a handful of soba noodle top with 2 tsp of grated horseradish, a drop of wasabi paste and a big pinch of chopped shallot then pour in the bonito soy stock just enough to cover the noodle. This entry was posted in Mains, The DIshes and tagged dried anchovy, horseradish, Japanese, kelp, shallot, soba. Bookmark the permalink.